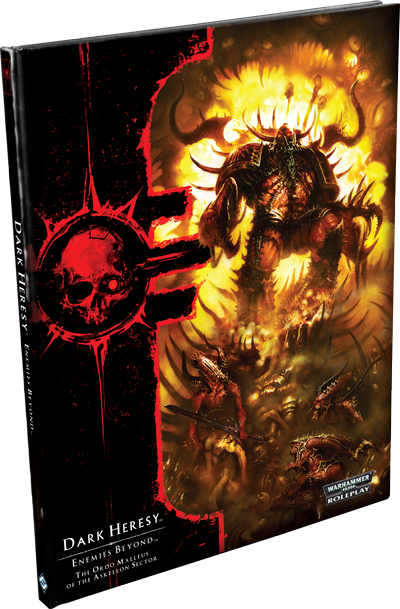 28 January 2016 | Dark Heresy 2nd Ed. A shadow and a threat looms over the Imperium. Its influence is inescapable, for it underpins the fabric of reality itself. Its malice is implacable, for those who dwell there heed only the call of Chaos. And yet, its evil shall not prevail today—not while the men and women of the Ordo Malleus stand ready to defend the Emperor’s people! 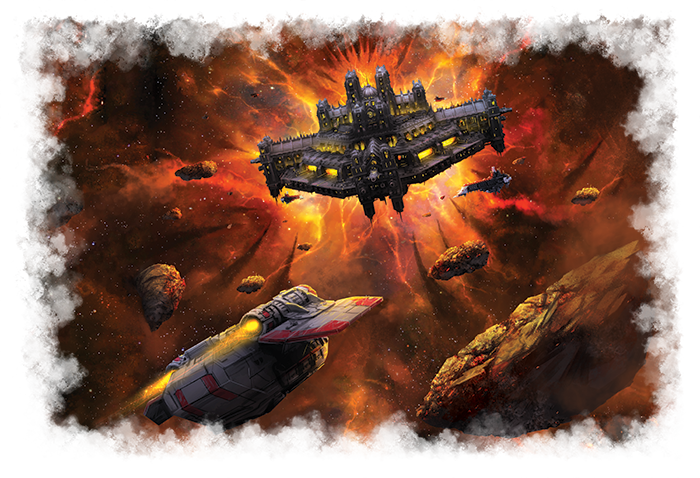 Complete the trilogy of threats facing the Imperium with your copy of Enemies Beyond, now available at your local retailer and online through our webstore. Enemies Beyond is a supplement for Dark Heresy Second Edition that pulls back the curtain on the unending struggle against the Warp and the creatures that spawn from the Immaterium. Here, you’ll find details on all four of the Ruinous Powers, their preferred tactics, the peculiar natures of their Daemons, and their plots to bring ruin to all Mankind. You’ll also gain access to exclusive new weapons to battle the Daemonic threats, as well as new character creation options, including new home worlds. 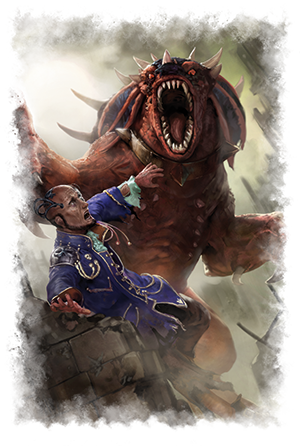 Like every other supplement for Dark Heresy Second Edition, Enemies Beyond offers a host of unique new content specifically related to the battle against the denizens of the Warp. You can wield new weapons in your fight or unlock new game options by playing as an Astropath or an Exorcised character. Throughout the book and all your actions, however, there runs a single thread—will you fall to the very corruption you fight? Will you dare to take up the weapons of the enemy in hopes of supporting the Emperor? 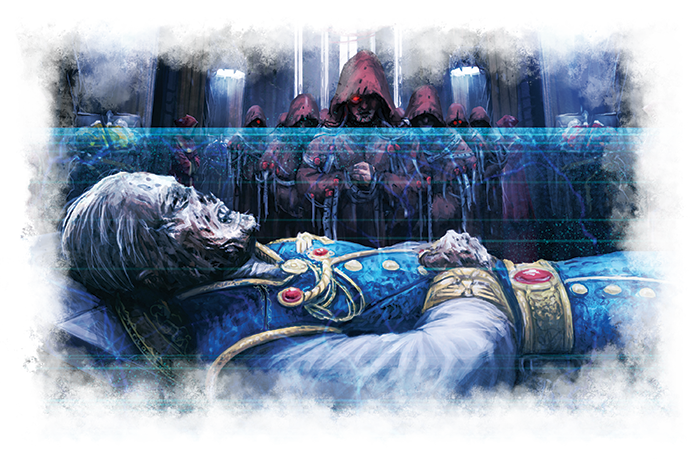 In our Enemies Beyond designer diary, writer Tim Cox explored the temptations that the Warp may offer to Acolytes of the Ordo Malleus. Ultimately, there are two types of Daemonology practiced in the Imperium. Sanctic Daemonology allows you to turn back the creatures of the Warp, banishing their presence or increasing your prowess for battle against these spawn of evil. The other tree of Demonology is known as Malefic Daemonology—regarded by some as the most profane sorcery. An Acolyte practicing Malefic Demonology could rightly be considered a heretic, but the power may be invaluable and life-saving in your fight against the Warp! Walking even further down the path to heresy, this supplement offers you the chance to enter into a Dark Pact with a Daemon. These Dark Pacts can offer great power to an Acolyte, provided you can prevent the Daemon from twisting your words into some horrible caricature of their original purpose. Even if you get the powers you want, however, a Dark Pact always exacts a terrible price. Your soul is just the beginning—no Acolyte could truly comprehend the depraved possibilities of a Daemon’s request. You have faced the heretics, mutants, and raving cults that corrupt the Imperium in Enemies Within. You have clashed with xenos races and faced horrid aliens on the field of battle with Enemies Without. Now, you have the chance to complete the panoply of threats against the Imperium with Enemies Beyond. Pick up your copy of this Dark Heresy supplement at your local retailer today! Dark Heresy Second Edition is a roleplaying game of danger, mystery, and brutal violence set in the decaying far future of Warhammer 40,000. Players take on the role of defenders of humanity and embark on hazardous adventures into the dark heart of the 41st Millennium. As an Acolyte of an Inquisitor, you’ll serve at the front line of a great and secret war to root out dangers that imperil all of humanity. 29 Dec 2015 Dark Heresy 2nd Ed. 29 Oct 2015 Dark Heresy 2nd Ed. 12 Oct 2015 Dark Heresy 2nd Ed.